Early in the summer of 1929, Cleveland buzzed with excitement about the National Air Races scheduled to come to town. Mr. Lee Clegg of Thompson Products was approached by a volunteer worker of the National Air Races to ask if Thompson Products Co. would provide a trophy for one of the many races being held for the first time in Cleveland. Clegg and Ray Livingstone looked over the list of races needing a trophy and discovered that, for whatever reason, no other company chose to provide a trophy for the International Land Plane Free For All. 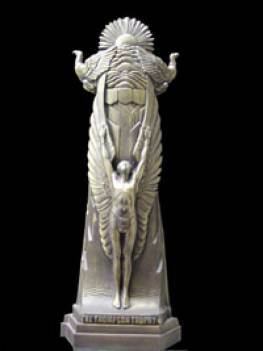 The trophy was fashioned of bronze, mounted on a black marble base. It represented Icarus, the first man to fly, according to Greek mythology, with wings spread, facing skyward, symbolizing man's ever-constant desire to fly. A tapered cliff rises behind Icarus, suggesting man's progress in conquering the air throughout the centuries. In bas relief about the cliff are sculptured epochal milestones in man's attainment of great speeds. Above the cliff are billowy clouds, perched eagles, and a rising sun; and surmounting all is the high-speed airplane that won the last years Thompson Trophy Race. (Note: this was done for two years and discontinued). Names of the winning pilots were to be engraved on the ten shields mounted beneath the clouds.